AGL Energy has conditional agreements to acquire the two thirds of the Loy Yang A power station and brown coal mine in Victoria it does not own and increase its interest from 32.54 per cent to 100 per cent. The transaction is conditional on ACCC approval, removal of the Federal Court undertakings that limit AGL's ownership of the holding vehicle, Great Energy Alliance Corporation Pty Ltd (GEAC), and on GEAC being able to receive the first carbon assistance payment from the Federal Government. If the transaction proceeds, it will increase AGL's reliance on coal as a fuel from 16 per cent to 37 per cent. This is a significant percentage for an activity that is environmentally damaging, and enough to raise significant concerns about AGL's asset mix and environmental commitment. For these reasons, if the conditions are removed and the transaction proceeds, Eco Investor will cease coverage of AGL. The full ownership of Loy Yang A dramatically changes AGL's generation capacity by fuel source. AGL says the contribution of gas will fall from 44 per cent to 33 per cent, wind will fall from 21 to 16 per cent, and hydro will fall from 17 per cent to 13 per cent. The combined gas, wind and hydro contribution will fall from 82 per cent to 62 per cent. 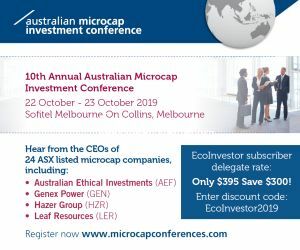 While this is still above Eco Investor's 50 per cent guideline, this is mitigated by the negative trend together with the controversies around some of AGL's coal seam gas activities and the environmentally harmful nature of the brown coal usage. The generation numbers also include 560 MW of generation under construction including the Macarthur and Hallett 5 wind farms, so the current carbon content before these come online would be around 40 per cent. AGL says the additional generation share from Loy Yang A will substantially increase its capacity to meet its retail load, but there would be other and non harmful ways to meet that need. APA Group reported that net profit after tax for the December half was down 5.9 per cent to $66 million. Net profit after tax but before significant items was up 20.8 pe cent to $76 million. The half year distributions rose 3 per cent to 17 cents. The distribution payout ratio is 69.2 per cent. Earnings were driven by pipeline expansions and acquired businesses, including additional capacity sales from completion of the Young Wagga looping project, ownership of the Amadeus Gas Pipeline that was previously leased by APA, and the Emu Downs wind farm business in WA. Group managing director Mick McCormack said the result reflects APA's efforts to develop and acquire strategic assets to take advantage of the growing demand for gas. "We have a well-placed and diversified portfolio to meet the demand for cleaner gas-fired energy," he said. Shares in Envestra have reached a new three year high of 81.5 cents. The company announced a net profit after tax for the first half of $40.7 million. This was 16 per cent higher than for the December 2010 half year. The result was due to higher tariffs in Queensland and South Australia, but lower volumes due to warmer weather in winter and spring. The interim dividend is 2.9 cents per share. The full year dividend is 5.8 cents, up 5.5 per cent. GAW group managing director Peter Crowley has sold 177,500 shares for $403,854. The average price was $2.27. Securities in Hastings Diversified Utilities Fund continued their run with a new three year high of $2.18 on 20 February. The Fund recorded a net loss of $29.9 million for the year to 31 December 2011. There was $25.5 million in realized and unrealized losses due to South East Water derivative securities. Hastings incentive fees as responsible entity were $57.3 million, up from $22.3 million. However, the Fund had a 33 per cent jump in net profit from continuing operations to $43.2 million. Operating cash flow from continuing operations rose 17 per cent to $112.7 million. Chief executive officer Colin Atkin said robust long-term revenue underpins solid growth outlook, and that in the medium term, HDF is poised to deliver significant growth in revenue and distributable cash flows. Construction of the South West Queensland Pipeline expansion was completed on time and under budget. The annual distribution is expected to remain steady at 10 cents per security in 2012 and rise 1 to 2 cents per security in 2013. Hastings has received credit approvals for refinancing of $1.375 billion in senior debt facilities for Epic Energy. The proceeds will be used to replace all existing senior and mezzanine debt facilities, including the project finance facilities used to fund the South West Queensland Pipeline (SWQP) Stage 3 expansion. The financing was arranged with six major financial institutions. They consist of three tranches including an 18 month debt facility of $425 million, a $600 million three year term facility and a $300 million four year term facility, as well as a $50 million three year revolver facility for capital expenditures. There is an immediate cash flow benefit due to interest cost savings of $20-$25 million per year to 2015, when compared to the anticipated costs to refinance the current debt tranches at their scheduled maturity dates. Tassal Group made a net profit after tax for the six months to 31 December 2011 of $13 million. This was down 7 per cent on the $14 million in the December 2010 half. Revenue rose 16 per cent to $127.5 million, thanks to growth in domestic retail and wholesale sales. "Whilst export markets were severely affected by low global prices and a volatile foreign exchange rate, the strong growth in Group revenue was achieved through increasing domestic product sales to existing customers and further domestic market penetration through attracting new customers and developing new products," said managing director and chief executive, Mark Ryan. With operating earnings growing and Tassal's growth infrastructure in place, directors declared an interim dividend of 4 cents per share unfranked. There was no interim dividend in the first half of 2010-11. The financial and operating performance reflect Tassal's strategy to deliver long term sustainable growth in shareholder value, he said. "At the heart of Tassal's strategy is a focus to grow domestic market per capita consumption through increasing domestic retail and wholesale penetration and distribution. The strong growth achieved in retail and wholesale sales is a clear indication that our strategy is working. "The overall strength of Tassal's business model can clearly be seen in the Company's growing operating cashflows and resilient earnings base during a period of substantial price pressure in the fresh hog for export and domestic wholesale markets. "In addition, Tassal's balance sheet continued to strengthen, with gearing down to 30.7 per cent, at the low end of the Company's target range. "Tassal's very successful farming program has continued to deliver growth in fish and harvest size over the past six months. The average fish harvest size was up 6.75 per cent on the same period last year. With a substantial fish inventory still growing, Tassal is well placed to continue growing domestic market per capita consumption and leverage attractive market fundamentals," said Mr Ryan. Shares in Toxfree Solutions touched a new one year high of $2.70 on 22 February. That's was a gain of $1 since last August. Toxfree reported a rise in net profit of 70 per cent to $7.9 million for the December half. Revenue rose 41 per cent to $92 million. Earnings per share rose from 5 to 8 cents. However, as with previous years, no interim dividend will be paid. The debt to equity ratio fell to 26 per cent. Medical waste company SteriHealth increased its net profit after tax by 11 per cent to $2.3 million in the December 2011 half year. Revenue rose 4 per cent to $26.2 million. The growth was organic and driven mainly by a 10.9 per cent increase in the reusable sharps collector markets, a 19 per cent increase in waste management services, and a 14.6 per cent sales increase the SteriHealth Laboratory Products business. Volumes in the clinical waste market were in line with the previous half year. There has been significant and pleasing growth from the roll-out of the new clinical waste collection system, Clinismart, said the company. The KDL Products business acquired in November 2011 has been fully integrated and is performing very well. KDL Products manufactures and distributes point of use waste containers and accessories for hospital environments. Dan Daniels, managing director of SteriHealth, said "SteriHealth has continued to deliver strong revenue growth while at the same time pursuing operational efficiencies aimed at improving margins. The continued investment in people and resources will allow us to successfully pursue our growth strategy. Our focus will continue on penetrating new segments in the healthcare market and offering new products and services." Qube Logistics has recorded a big rise in half year revenue but a big fall in profit, and is acquiring a bulk minerals transporter. Qube is to acquire Giacci Holdings Pty Ltd, a mineral haulage and handling business that provides mine to port solutions for most of its customers and usually assumes full responsibility for the supply chain. Giacci manages over 17 million tonnes of bulk products per year. Qube said Giacci is a well run, quality business that operates nationally with significant operations in WA. The company has 350 employees and a fleet of bulk handling equipment. Strategic partnerships and joint ventures incorporate shipping and rail. The business will form part of Qube's Ports & Bulk division. The purchase price is $119 million of which around $18 million is deferred for two years and subject to adjustments. Qube will assume net debt of $26.6 million. The acquisition will be funded through $20 million of new Qube shares to the vendor at $1.4749 per share with the balance funded from Qube's cash and debt facilities. The deal should complete in March. The acquisition is expected to be earnings per share accretive in the first full year of operations. Maurice James, Qube's managing director, said "The acquisition will enable Qube to provide a complete mine to port logistics solution covering transport, stockpile management and stevedoring. This enhanced logistics capability should provide significant opportunities to expand the range of services offered by the Qube group." Qube's December half profit fell 77 per cent to $8.1 million, while revenue jumped 398 per cent to $347.4 million. The statutory results include $47.4 million of non-recurring costs associated with the previous trust structure and the restructure completed last year, and four months of consolidated earnings from some controlled entities and four months of equity accounted profits from associates. Transpacific Industries Group made a net profit after tax and significant items of $16.5 million for the six months ended 31 December 2011, compared with $31.7 million for the previous corresponding period. Underlying net profit after tax, excluding significant items, was up 25 per cent to $35.2 million. Chief executive officer Kevin Campbell said although there were difficult economic conditions in Australia and New Zealand "Our waste management businesses have again achieved both revenue and profit growth, and we are especially pleased with the improved earnings recorded by our Commercial Vehicles division and the progress being achieved in the turnaround of the Manufacturing division. "The refinancing package successfully completed in November 2011 is allowing us to focus on the business and the operational improvements that can be achieved across all divisions within the Company. "In the short to medium term, addressing inefficiencies within and across the businesses, improving customer service levels and improvements to our safety performance are priorities." Group revenue was up 5.8 per cent to $1.12 billion. Total Waste Management businesses increased revenue by 3.3 per cent, the Commercial Vehicles division increased revenue by 31 per cent, and the Manufacturing division result was break even. Infigen Energy has criticized a NSW Government noise audit into three wind farms in NSW, according to the Sydney Morning Herald. The audit will cover the Capital, Cullerin Range and Woodlawn wind farms in southern NSW, which are the State's three operational NSW Government approved wind farms. Both Capital and Woodlawn are owned by Infigen. The Minister for Planning and Infrastructure, Brad Hazzard, has commissioned the independent audit to ensure the wind farms are meeting their approval conditions. "I asked the Department of Planning and Infrastructure to undertake this audit, following continued resident complaints about noise issues," said Mr Hazzard. "Although investigations conducted by the Department to date have found the wind farms are complying with noise limits, the Department is continuing to receive noise complaints from nearby residents," he said. "The audit will also provide information on low-frequency noise from these wind farms to provide input into the finalisation of Statewide wind farm guidelines." The Department's compliance unit will also assess other issues covered in consent conditions, including visual amenity, flora and fauna impacts, blade flicker, community contributions and electromagnetic interference. Key stakeholders will be consulted as part of the audit including residents, local councils, the Environment Protection Authority and wind farm proponents. "The audit process will include a questionnaire, meetings and a public information line. It is expected to take until August to complete," said Mr Hazzard. "Wind farms will play an important part in the State's energy future. However, it is important the community has confidence these installations are operating in line with their consent conditions and they are not diminishing a local community's lifestyle." Energy Developments reported a net profit after tax and specific items of $4.4 million compared to a $33.2 million loss in the prior period after an impairment loss of $34.3 million. The current period profit was reduced by $5.6 million due to costs associated with the acquisition of enGen. Profit before specific items was down 10 per cent to $11.7 million, mainly due to foreign exchange impacts and the expensing of increased development activities. The company said it is well positioned for growth in its domestic and international portfolio and remains focused on enhancing the value of existing projects. This is through expansions of commercial contracts, developing new projects and pursuing strategic acquisitions in existing and adjacent energy sectors, integration of enGen which is now EDL Remote Energy, and pursuing further growth opportunities and monitoring the Federal Government's clean energy and carbon abatement initiatives. ERM Power made a profit after tax and minority interests for the December half year of $51.2 million, compared to a loss of $6.3 million in the previous corresponding period. Key factors in the improvement include strong growth in electricity sales, a gain from the acquisition of a controlling interest in the Oakey power station, and the consolidation of Oakey for the first time from 1 July 2011. The improvement also includes an unrealized gain of $23.4 million in the fair value of financial instruments. Underlying profit was $27.9 million compared to a loss of $0.8 million in the previous corresponding period. Hydromet Corporation announced a loss for the December half, and says a number of shareholders may have received an unsolicited offer from Simon Henry to buy shares in HMC that may contravene the law. Chairman Lakshman Jayaweera said the company has taken legal advice about the letters, and that the advice identifies a number of ways in which the letters may infringe the Corporations Act 2001. The letters have been reported to the Australian Securities and Investments Commission (ASIC) requesting an investigating. Meanwhile Simon Henry has increased his holding to 16.5 per cent. The deal for Hydromet to acquire PGM Refiners Pty Ltd is falling apart due to conditions that have not been fulfilled. The parties are finalizing a document by which the Agreement will cease to have any effect and each party will be released from all obligations and liabilities. Hydromet made a consolidated loss after tax for the December half year of $1,880,000, compared to a 2010 first half profit of $1,330,000. Revenue fell 12 per cent to $33 million. Competition and the price of used batteries increased during the period. The company continued to experience strong demand for its lead products, but the collapse of lead prices in August/ September 201 significantly impacted the results. The strong Australian dollar further damaged revenue. A factor in the results was $0.5 million of capitalized development cost of the lead smelter being written off. Excluding the write-off, the Group's operating loss before income tax for the half year is $2.2 million. The used battery recycling plant processed 18,000 tonnes of used batteries during the six months. The construction of the lead smelter at Tomago was deferred. Clean Seas Tuna saw its December half revenue fall 36 per cent to $13.3 million. The loss fell 24 per cent to minus $7 million. The company said it also expects an improvement in its full year result. Clean Seas said its Southern Bluefin Tuna fingerlings continue to grow in its temperature controlled land facility, and it is weaning 1,500 juveniles at a size of thirty to fifty millimetres. Electrometals Technologies' saw its half year revenue fall 73 per cent to $1 million, and its loss after tax increased 19 per cent to $2.9 million. Chairman Gregory Melgaard said that since 1991 Electrometals has been commercializing its patented EMEW (ElectroMetals ElectroWinning) technology. "Over the years management has attempted a number of strategies to achieve this with varying degrees of success: selling plants outright, selling supplies, selling maintenance packages, selling systems using EMEW and related technologies, selling laboratory and engineering services, charging royalties, and selling metal from EMEW cells we own and operate ourselves. "We continue in our search to find the right business model to commercialize this technology. "2011 was another difficult year for Electrometals. Sales declined from a little under $3.9 million to $1.1 million. There were no significant plant sales. Net loss from continuing operations increased by $0.9 million to $2.9 million. "Perhaps of even more concern is the cash consumption of the business. During the year we raised $3.9 million. However $2.7 million of this has already been consumed. Our year-end cash balance is $2.0 million, an increase of $1.2 million over the previous year. "In response to this continuing poor performance we undertook during the year a major strategic and operational review. This review highlighted several fundamental problems which we outline in the Operations Review. Intermoco says it has signed three embedded network sites, and is raising new capital. The estimated annual revenue from the new sites when commissioned is $900,000, with upfront product sales revenue of $300,000. This takes to 29 the total number of sites signed up, with nine of these live and income-generating. The new sites are a 155 unit Retirement Village in Adelaide, a 40 unit residential stage in Melbourne, and 10 large commercial tenants in Sydney. The board said it has investigated supplementary sources of funding, and has gained further support from property development group and its largest shareholder, the Copulos Group, which will participate in a $410,000 share placement at the current share price and also $410,000 short-term convertible note funding over the next 12 months. Another, unrelated shareholder will also participate in these funding initiatives. The company has also foreshadowed a renounceable rights issue. Mission NewEnergy is to help develop a new palm oil plantation in Indonesia. The company has acquired an 85 per cent stake in Oleovest Pte Ltd, a company incorporated in Singapore which has a 70 per cent equity stake in PT Sinergi Oleo Nusantara (PTSON). PTSON is a new Indonesian company that is 30 per cent owned by PT Perkebunan Nusantara III (PTPN III). Under the joint venture, PTSON will establish a new downstream palm oil and oleo-chemical complex at the PTPN III owned Sei Mangkei Industrial Zone in North Sumatra, which in the first stage is expected to consist of a 600,000 tonnes per annum edible oil refinery, a 250,000 tpa Methyl Ester (biodiesel) plant and a 100,000 tpa Fatty Alcohol plant. The project has an estimated cost of US$200 million and will require the arrangement of US$140 million in debt and US$60 million in equity before construction begins. Mission will invest US$3 million to acquire the stake and fund the initial operations of PTSON. Once fully funded, it is anticipated that the project would be implemented over three years. "This is a good opportunity and new strategic direction for Mission as the company looks to diversify into a more established and rateable business" said Nathan Mahalingam, Group chief executive of Mission. However, at this stage Mission has not given any details on the environmental credentials of the joint venture. PT Perkebunan Nusantara III says it has a vision to become a world-class agribusiness company, to develop a sustainable agro-based downstream industry and carry out environmental-friendly business activities. Given the controversial nature of palm oil plantations, more details of the project are needed. Meanwhile, the company's net loss for the December half was $4.63 million, while revenue was $2.23 million. Orbital Corporation reported an interim profit after tax of $103,000 compared to a profit of $29,000 in the December 2010 half. Synerject increased revenue 17 per cent to US$66.4 million, and profit after tax up 65 per cent to US$5.07 million. Orbital's share of the profit was $2.1 million. "Synerject achieved another great result including a record profit after tax in the half year and we look forward to continuing growth of this important and successful investment," said Mr Stinson. Synerject is targeting further aggressive growth in the future, however due to the timing of customer build schedules it is not anticipated to be realized in Orbital's second half. Synerject will continue to be profitable and cash flow positive but the strong Australian dollar and timing issues noted above will likely result in a reduced equity accounted contribution from Synerject in the second half, he said. Mr Stinson anticipates that Orbital Autogas Systems (OAS) will see further revenue growth in the second half, in line with Ford production, as will Sprint Gas Australia (SGA) as the LPG aftermarket goes through the typically stronger cycle of the year. Although the EcoLPi system volumes are below expectations the increased revenue will flow through to improved results for the business segment. "The Orbital Consulting Services (OCS) international business is affected by the strong Australian dollar, and as a result the order book at 31 December 2011 is lower than historical levels and internal targets. This will result in a decline in consulting services revenue in the second half compared with both the first half and the same period last year. "The anticipated reduction in OCS revenue will also put pressure on cash resources. Orbital is however confident that the unique technology and services offered by OCS will result in a recovery of the order intake, particularly in the prospective UAS market and on-going FlexDI application engineering contracts." Environmental consultant Pacific Environment lifted half year revenue 11 per cent to $5 million but recorded a loss after tax of $230,00 compared to a 2010 half year profit of $695,000. The board said it is "confident that the growth plans for the rest of this financial year will provide a greater level of profit going forward". Electricity storage company RedFlow made a half year loss of $6.2 million, in line with expectations. Sales revenue was $2.45 million. RedFlow said its strong position as a global leader in the flow battery market is becoming increasingly evident from market feedback and the levels of enquiry being received. During the half, all 60 R510 residential energy storage units were delivered to Ausgrid as part of the Smart Grid, Smart City project, with completion of the first 40 installations in Newcastle. The production processes and supply chain were settled for the Generation 2.0 ZBM, new production equipment was commissioned, ZBM production was significantly higher, the transition to contracted offshore ZBM manufacturing commenced, commercial deliveries of initial ZBM components began, the first sub-assemblies were supplied for evaluation, and the design of production equipment and the manufacturing line began at the contracted Singapore factory site. With the production transitioning of the ZBM, RedFlow anticipates a lower level of sales in the current half year. This phase will allow RedFlow to focus on international market development, delivery of the initial trial systems and customer engagement in the USA and completion of the first M90 larger scale system. Lynas Corporation has run into legal problems in Malaysia. The company has been served with documents relating to court proceedings against Malaysia's Atomic Energy Licensing Board (AELB), the Malaysian Department of Environment (DOE) and Lynas Malaysia regarding the Lynas Advanced Materials Plant (LAMP). The applicants, individuals who live near the LAMP, want the court's permission to apply for a review of the decision by the AELB to grant a temporary operating licence (TOL) for the LAMP. The application also seeks to delay operational start up of the LAMP, pending the determination of the proceedings. Meanwhile, construction of the LAMP continues and Lynas is on track for first feed to kiln and first production during the second quarter of 2012. Advanced Engine Components says fund raising negotiations have progressed and to allow negotiations, due diligence and preparation of formal documentation to continue, the negotiating party has agreed to provide, interest free, secured interim bridging finance to ACE. All lenders to ACE have consented to the bridging finance with priority given over their existing security. ACE said it is unable to estimate the likely success on the non binding term sheet or other ongoing discussions. In the opinion of the ACE Board, the only likelihood of satisfying all outstanding employee and unsecured creditor entitlements in an equitable manner is for ACE to continue as a going concern and successfully complete the current negotiations. American Depositary Receipts (ADRs) for algae to transport biofuels technology company Algae.Tec have commenced trading on the highest tier of the OTC market, OTCQX. Carnegie Wave Energy has welcomed the UK House of Commons Energy and Climate Change Committee report on The Future of Marine Renewables in the UK.' Carnegie said the report highlights the opportunities and benefits of developing a world leading marine energy industry and the need for the UK to adopt a visionary approach to marine energy. The report says that wave and tidal energy have the potential to meet 20 per cent of the country's electricity needs while also becoming a major export opportunity for marine devices, components and specialist skills. The UK has allocated over £200 million of public funds to marine energy grant funding. The UK has the largest wave resource in Europe and the report says the UK is currently the world leader in the development of wave and tidal devices. The report has recommendations to ensure the UK retains its leading position, such as providing increased clarity about revenue support beyond 2017 and ensuring appropriate investment in new grid connections. Earth Heat Resources has secured $40 million in additional finance for its Copahue geothermal development in Argentina. Earth Heat has mandated Corporacion Interamericana para el Financiamento de Infraestructura (CIFI) as lead bank and lead arranger for a drilling loan of US$22.5 million, subject to due diligence, and has secured an agreement for $17.5 million in capital contingency finance with AGS Capital Group LLC (AGS). CIFI will provide the debt financing for the drilling loan directly and through syndication, with the proceeds to be used for drilling 3 of the 4 wells planned for Phase 1. The drilling loan will close contemporaneously with the senior debt. The AGS capital contingency funding is there if needed. Total debt for Phase 1 is US$86.5 million. Earth Heat said it is on the threshold of full funding for the Copahue Development. In November last year it announced a $134 million project finance loan from Inter-American Development Bank. Clean power company Enerji has begun installing Australia's first Opcon Powerbox waste heat to power system at the Carnarvon project in WA. Commissioning is expected in late March. WA minister for Energy, Peter Collier, inspected the system before its departure for Carnarvon and was also briefed on Enerji and its business. Geodynamics has appointed Minesh Dave as a non-executive director and Dr Prame Chopra as an alternate director to Mr Dave, who replaces recently retired Banmali Agrawala. Mr Dave has 29 years professional experience in the power sector covering engineering, fuels, environment, project feasibility, project development, project construction, policy and regulatory, strategy and business development and corporate functions. He is a mechanical engineer with a Master of Technology in heat, power and refrigeration. He has been an employee of The Tata Power Company Ltd since 1983 and is currently its Chief Representative - Indonesia. His key responsibilities for Tata Power include managing the development of geothermal projects in Indonesia and the development of Power Projects in the Association of South East Asian Nations (ASEAN). Greenearth Energy and its Israeli energy efficiency partner Metrolight Ltd have welcomed the Australian Government's $1 billion Clean Technology Investment Program. Grants will help manufacturers buy new plant and equipment which cuts their energy costs or reduces carbon pollution. Projects that can be supported include switching to less carbon intensive energy sources or installing new manufacturing equipment, processes and facilities to reduce energy consumption and carbon emissions. Shares in Hot Rock reached a one year high of 8.3 cents on 21 February. The shares have been trending upwards since December. The peak came one day after Hot Rock and the world's largest geothermal company, Energy Development Corporation (EDC), commenced field activities at the Calerias project in Chile, and two business days after Intersuisse commenced coverage of Hot Rock with a research report that is available on Hot Rock's web site. Calerias is said to be among the leading clean energy projects in Chile and has the potential to become one of the first geothermal electricity operations in South America. EDC geothermal experts are on site to undertake detailed geological and geochemical surveys as the precursor to identifying drilling targets. Hot Rock executive chairman Dr Mark Elliott said "We are excited to have aboard a company of the calibre of EDC that is unsurpassed in terms of 35 years of in-house expertise and experience in developing and operating volcanic geothermal projects. EDC brings their expertise to the joint venture projects drawn from a workforce of over 2,500 staff. "The joint venture has hit the ground running at Calerias, with EDC already allocating personnel for geology and geochemical surveys to be followed up in the next few weeks by the commencement of a detailed magneto-telluric (MT) geophysical survey. "The fact that EDC has mobilized so quickly following the closing of the joint venture deal in early February is both testament to the quality of the project and the capabilities of EDC. Intelligent Solar has made progress with the company's Deed of Company Arrangement fully effectuated and terminated. The company has consolidated its share capital on a 1 for 7 basis and issued 258.6 million shares and 60 million options as previously outlined. It has 290 million shares on issue. A study into its greenhouse gas emissions has found that MediVac's new MetaMizer MM 240 SSS is a greener option than commonly-used waste treatment technologies. Environmental consultancy Mike Ritchie & Associates (MRA) compared the MetaMizer MM 240SSS clinical waste converter against traditional waste treatment technologies including incineration, autoclave sterilization, transportation and incineration/ autoclaving. The study recommended the MetaMizer as an appropriate clinical waste treatment option for hospitals, medical waste treatment operators, quarantine facilities and medical research facilities operating in a constrained and environmentally responsible economy. The study says "From a carbon footprint perspective, the MetaMizer's MM240 performance is on par with or better than that of commonly employed clinical waste management methods such as incineration and autoclave sterilization. In fact, on a best case scenario an on site MetaMizer is almost twice as good as local incineration and nearly three times as good as interstate incineration." MediVac executive chairman, Paul McPherson, said "We now have hard data that confirms our new technology will deliver a cleaner and more efficient process for treatment of hospital waste. This is good news for our prospective customer base both here in Australia and overseas." A copy of the report is on MediVac's web site. MediVac has now drawn down $1,394,903 from the La Jolla Cove convertible note. MediVac's shares continue to trade at their all time low of 0.9 cents. Panax Geothermal is to collaborate with the University of Melbourne to help deliver a long-term commercial solution for Panax's Penola Geothermal Project in South Australia. Managing director Kerry Parker said the research and studies conducted by the University will provide insight into the complications found during well-testing, and contribute towards further progress of remediation options for the well. "We are hopeful that this important research will help us answer questions about the seismic state of the area around Salamander-1, and the state of the key formations as producing geothermal reservoirs," he said. "With a better understanding of the results, we will be able to progress to the next stages of remediation and position ourselves to secure funding from the Australian Federal Government to allow further progress of this nationally important energy source." The two-year research partnership with the University gives Panax access to the Australian Geophysical Observing System (AGOS), a $23 million integrated research infrastructure platform funded by AuScope Limited that will provide data to facilitate better long-term management of geological resources, particularly in Australia's energy-rich sedimentary basins. Southern Crown Resources has received some positive clarity on its disputed rare earths project in Zambia. A letter from the Acting Director of Mines in Zambia states that the Department is of the opinion that Southern Crown's partner African Consolidated Resources Plc (ACR) holds the sole valid mining right over the Nkombwa Hills exploration licence area and that the excision of the Nkombwa Hill area to a third party was invalid as it contravened the provisions of the Zambian Mines and Minerals Development Act of 2008. "Although this is a very positive outcome, resolution of this issue is dependent on a physical change within the registry system," said Southern Crown. "This resolution remains contingent on the lifting of the moratorium on the licensing system announced by the Minister of Mines and Natural Resources on 7 October 2011 to remove irregularities that had accumulated in the licensing system, including the removal of the invalid licence over Nkombwa Hill. "ACR and Southern Crown are focused on achieving a final resolution as soon as possible, but to the extent that the process is affected by the general moratorium, this is outside the Companies' control," it said. Water Resources Group says its Research and Development division, Campbell Applied Physics Inc (CAP), is investigating the application of its technology to economically extract and separate rare earth elements (REE). This is a new application for the O3CD System, and the project will be developed in cooperation with the US Department of Energy's largest science and energy laboratory, Oak Ridge National Laboratory (ORNL) in Tennessee. ORNL is engaged with CAP under a Cooperative Research and Development Agreement (CRADA) to further the development of the O3CD System and its enabling Capacitive Deionization (CD) technology. WRG said ORNL is a world-class facility that can identify elements down to parts per billion in liquids, gases and solids. Recent meetings between ORNL and CAP have focused on investigating techniques to identify and extract rare earth elements (REE). A combination of CAP's O3CD front end system employing a REE-optimized CD, followed by one of several candidate separation technologies from ORNL could enable economical extraction of REE as metal sulfides, metal oxides, or zero-valence metals. The O3CD System is the same technology being developed by CAP to treat the contaminated water from coal seam gas drilling. To fast track testing, CAP will have access to the US$1.4 billion Spallation Neutron Source facility located at Oak Ridge. WRG said the value of the strategic relationship with ORNL and access to the facilities is measured in the millions of dollars. Chief executive, Brian Harcourt, said "The sheer scale of commercial benefit to both our organizations is worthy of the extensive resources being deployed on a joint basis.